Mar-Zik, the Blightcaller is a Taken Wizard encountered in a special Heroic version of Story mission Fear's Embrace. This Mission appears in the third and final stage of the Hunger Pangs Quest. 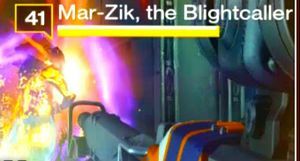 Despite being a "Blight-caller," Mar-Zik never summons any Blights.